← Bible Contradictions #11: How long will the earth last? Bible Contradictions #12: How many sons did Abraham have? Abraham could have avoided the whole child abuse and attempted murder of his “only” son, Isaac, if he had paid a little more attention to god’s command. You see, multiple bible verses show that Abraham had more than one son. He had Isaac. And Ishmael (who was born before Isaac). And Zimran, Jokshan, Medan, Midian, Ishbak, and Shuah. Abraham should have done nothing, since god’s request to kill Isaac was completely impossible. It is not possible to murder your only son when you have more than one. The only way that believers can defend this contradiction is if they say that god does not recognize illegitimate children (as shown here). That’s messed up, god. This entry was posted in Atheism, Bible Contradictions and tagged Abraham, Atheism, Bible Contradictions, Christianity, contradictions in the bible, God, God of Abraham, Isaac, Ishmael, Judaism, Religion. Bookmark the permalink. 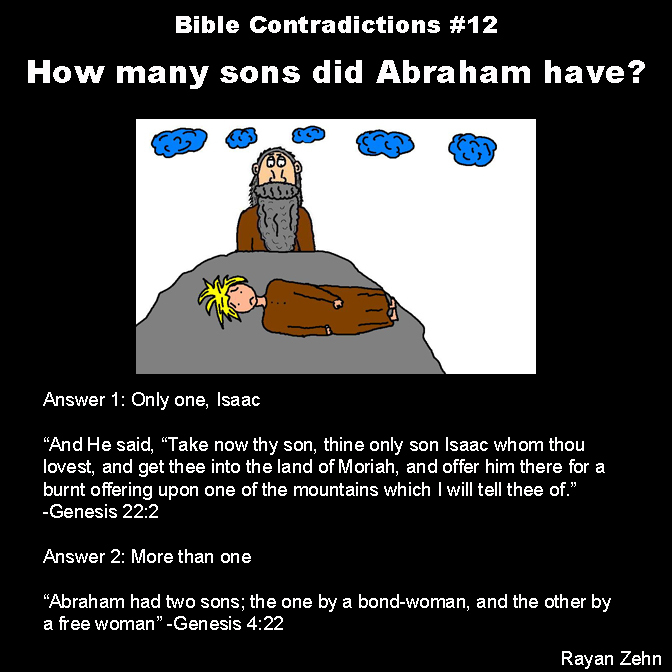 12 Responses to Bible Contradictions #12: How many sons did Abraham have? Unless Jacob was a twin the other brother was younger than Jacob. That means that one biblical story was told before the younger brother was born. I’m no Bible scholar, but somebody around here just isn’t thinking very hard. Jacob is the son of Isaac. So I’m not following. If you mean Ishmael, he was born before Isaac (14 years earlier), which means Isaac was Abraham’s second son. I’m not going to argue with you, but to help your understanding out I thought you should know that when the Bible calls Isaac Abraham’s only son, it’s talking about Isaac being Abraham’s only son born through promise; a promise that also said that the world would be blessed by the descendants of Abraham through Isaac’s descendants (Hebrews 11:17-19). Thanks! That brings up something else entirely, which I will blog about at a later time. No problem. Just wanted you to see how there’s no contradiction between the verses you referenced. Why does God refer to Isaac as Abraham’s ONLY son, when Ishmael was also his son? Ishmael was born before Isaac, and was still alive at the time of this incident. God uses the words “only son Isaac”, because in God’s eyes, Isaac was the “True” son of Abraham, by Covenant and by Promise. On the other hand, Ishmael was more of a “mistake” on Abraham’s part, when he committed adultery with Hagar. >>”(Genesis 21:10) Wherefore she said unto Abraham, Cast out this bondwoman and her son: for the son of this bondwoman shall not be heir with my son, even with Isaac. In God’s eyes, from that point onwards, Isaac was Abraham’s one and only true son. Here is my take on Bible Contradictions #12. Enjoy. I think you have the wrong citation for “Answer 2”. I look at Genesis 4:22 several times and couldn’t find any mention of Abraham.